How to furnish a one-room apartment and find room for all of your stuff? Find functional solutions for every corner you have: use open shelves and wardrobes, cabinets and chests of drawers of different sizes, and finally add two flexible coffee tables - one with storage basket and one with removable tray for serving. Textiles can make your bedroom cosier and homier. If you prefer a traditional style, mix and match different textures, natural fabrics and floral motifs. Use curtains, quilt covers and pillowcases, rugs and cushion covers to decorate and bring some warmth. Luminous, spacious and stylish - that's how your walk-in closet should look like! 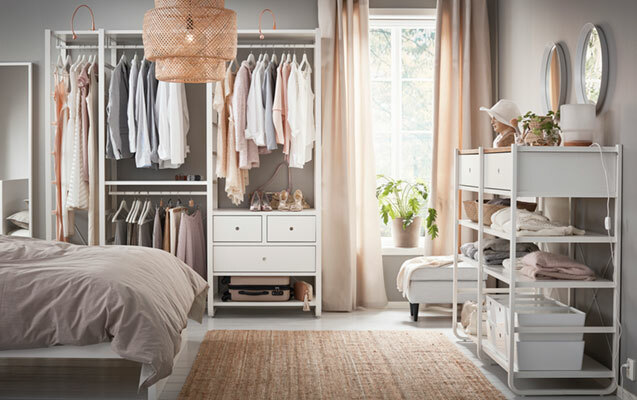 With PAX corner wardrobes and wardrobe interior organisers, there’s plenty of clothes storage for both him and her. 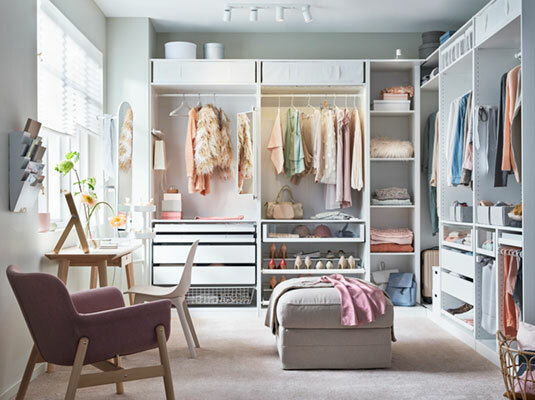 Besides, you can use the PAX planner to design a flexible and customizable wardrobe storage system that works around you. An eclectic bedroom in traditional style also works as a walk-in closet. A woman who lives here loves her beautiful garments and doesn't bother to hide this collection behind the wardrobe door. The whole interior reflects the colourful personality: from floral wallpapers, quilt cower and pillowcases to a patterned low pile rug and black stained wooden furniture, like an extendable table, a solid wood HEMNES bed frame with two side tables. Even if your bedroom is small, a properly selected furniture can make it look light and roomy. Meet BJÖRKSNÄS – our long-lasting bedroom furniture made of solid birch. This bedroom features a neat, lightweight bed frame, two bedside tables and chests of drawers with leather handles. A bedroom or a living room? Both. If you live in a small apartment, but still want to have two separate spaces, build upwards to gain a couple of extra metres of floor. Every centimeter of vertical wall space makes a difference. 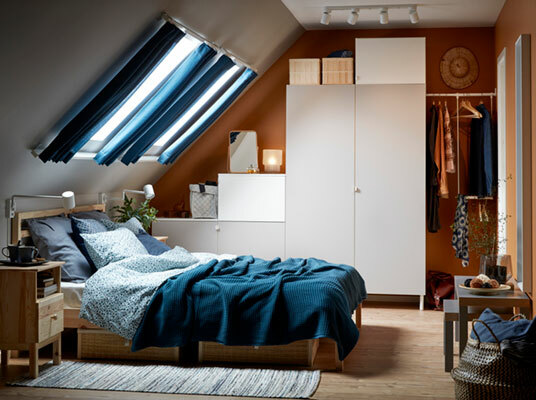 A loft bed frame is one of the ways to maximise your space. You can have a bedroom on the 'second floor' and enough room for a modular sofa and a coffee table underneath. Limited space, endless options - multifunctional furniture can make living in one-room apartment much more comfortable. In this case, a space-saving day-bed serves for both a sofa and a bed, and there are two bed storage boxes made of braided rattan underneath. The day-bed is framed by PLATSA wardrobe and storage system. Tricky spaces call for smart solutions. To match your needs and shapes of home, use PLATSA wardrobes. They fit perfectly in a room with sloped ceiling or under the stairs. And if there are any clothes or bedlinen left, hide them all under the bed. The bed storage boxes made of natural braided rattan go together with a wooden bed frame as parts of a single set. Walls painted in neutral colour, white stained wooden furniture and colourful bedlinen is all you need to make a modern style bedroom truly yours. Don't forget the ELVARLI open shelving units and clothes racks that serve for a wardrobe and add something from yourself. Out of wall space? Maybe our GARNES over-the-door mirror can help. A bedroom, a closet and a home office all in one room? For sure. This modern style flat is full of well-planned solutions. The ALGOT storage system with shelves, clothes racks and wire baskets serves for a wardrobe, and dark curtains serve for its door. The LISABO desk lets work in comfort and the VALLENTUNA modular sofa can be used as a bed or as separate armchairs. If you want a solid bedroom, be smart and choose one furniture series, as we did with traditional style SONGESAND in this room. The series features wardrobes, bed frames and chests of drawers that fit to each other as well as to other traditional style furniture. To make the bedroom cosier and even more classical, add some low pile rugs and stylish lamps. When you have only one room for you and your stuff, space-saving furniture always come in handy. 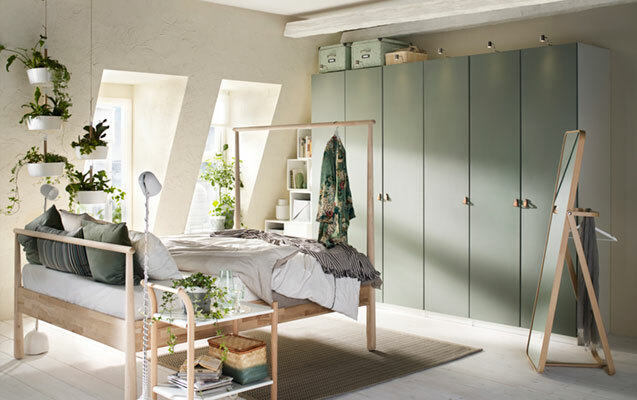 Try out the HEMNES bedroom furniture series: an open wardrobe and shelving units for those cute little things look great combined to FYRESDAL day-bed that can easily transform into a sofa or a single bed. Do you need space for clothes? Here it is. A spacious PAX wardrobe covered by 10-year guarantee spreads along the entire bedroom's wall, yet remains almost invisible. Its sleek design coordinates well with the colour of the wall and is finished with ÖSTERNÄS leather handles. If you need more space, you can also hang clothes on the high end of GJÖRA bed frame made of untreated solid wood. An open wardrobe: how to store clothes in bedroom? If you want to get rid of the wardrobe in your bedroom, we have some ideas for you. Meet our ELVARLI storage system with open shelves, clothes racks and chests of drawers. It can help you organise all of your garments or serve for a partition in the bedroom, if needed. Even if you live in a small one-room apartment, you can furnish it with style and for an affordable price. The IVAR shelving units made of solid wood can help you save space and money. As well as the UTÅKER stackable bed that can be used as a sofa or a spare bed, or quickly transform into a bed for two. The stacked beds stand steady since the upper bed has small plastic feet which fit into holes on the lower bed.